Airplanes and Rockets visitor Rob K. requested that the article be posted for the Small-Fry Special, a 1/2A-powered beginner's control-line model. Its all sheet balsa construction with the engine mounted using rubber bands makes the Small-Fry Special easy to build and repair, and provides a extra helping of forgiveness if you happen to botch a landing. The wing even has ailerons glued permanently in position for a right roll to help keep the lines tight. 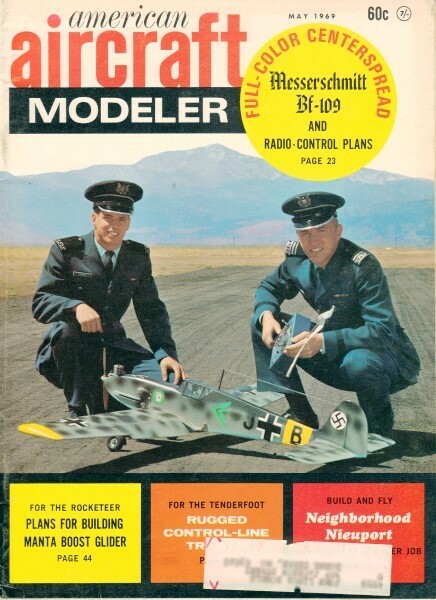 Photos and flying instructions are included in the article from the May 1969 edition of American Aircraft Modeler. For about $3, less its 049 engine, you can quickly build and fly this sturdy control-line trainer. With this reliable trainer the kids can go flying by themselves. Today's easy-starting 049 engines are no problem for a youngster. Flyer's sister holds. 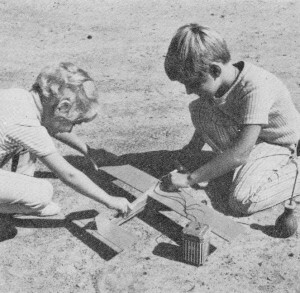 Balsa models are painted with model airplane dope so that the fuel and exhaust do not seep into the wood. Use two coats of clear and two coats of color. 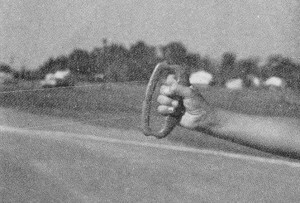 How you hold control handle is important. 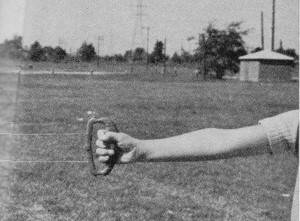 Keep your arm straight at all times. Lift arm for up, lower for down. Level is neutral. Line on top is for up, line on bottom for down. Raising your arm causes pull on up-elevator line and releases the other line slightly, causing the model to climb. Down-elevator is the opposite of up movement. Positions are a bit exaggerated here. 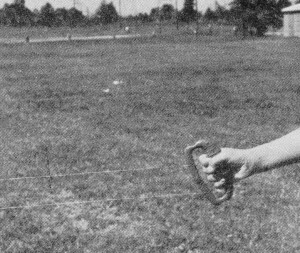 Arm motions only prevent over-controlling. Take off downwind so that model is airborne with wind keeping line tight. 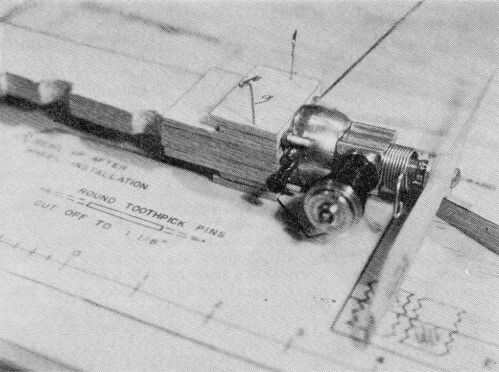 Engine is held in place with rubber bands looped around the mount and toothpick sections which key the motor on the nose. It will come off harmlessly in a bad crash, but is secure in flight. Put the engine on the toothpick studs to keep them properly aligned while assembling the nose doublers. Be careful to keep glue out of the intake screen on the rear of the engine. Using model cement, glue short lengths of 1/2"-wide pinking tape to the top side of elevator and stabilizer with plenty of overhang. When dry, fold down and across to opposite half, then glue again. 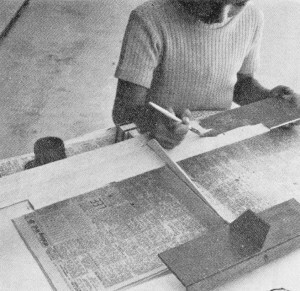 Construction begins with cutting the parts out as per the plans. Only two sheets of balsa are needed, model airplane glue, sharp knife, ballpoint pen, and soft building board. Leadouts from the bellcrank leave the inboard wing tip through eyelets or short lengths of tubing. These must be securely glued and gauzed to the wing. 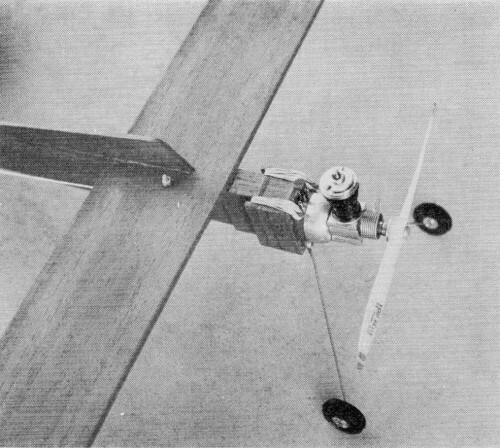 Note the aileron position. Wire pushrod between bellcrank and control horn on elevator has a double bend at its middle so that it can be adjusted for neutral elevator position with bellcrank parallel to fuselage. So you want to fly control-line models? Then try a rugged Small Fry for an easy, economical way to start. The parts for the basic model, namely the two pieces of 1/8-in. balsa, can be bought for under a dollar. The rest of the hardware items can be purchased for around $1.00, making the price for the works (less engine) around $3.00, including paint. A 1/2A or 049-size model can be difficult to fly because of its small size, and because it flies on shorter lines. Contrary to popular belief, larger models, say a 35-size, are a lot easier to fly, but they are also a lot more expensive. Thus, thousands of inexpensive 049 engines are sold every year, only to be stored in a drawer when the first building project ends up in a pile of balsa, or worse yet, is never completed because of the building time involved. The first thing to learn in the model plane hobby is to take enough time to perform each step properly. Something left undone or hurried over will end only in disaster. If you follow the construction steps in this article you will end up with an airplane that does fly well. This model was test-flown by my 5-year­old daughter! It did take a few crashes before she flew successfully. We went through five versions before we came to the final one, which is a cinch to fly. If set up as described, it will fly for anyone. Another favorable point is that it is rugged enough to survive a few mishaps, and easy to repair or rebuild. Simple parts make it easy to repair. But in case of a total break-up it's not hard to build a new one reusing the same hardware. The important thing is not to become discouraged if your first few attempts at flying result in failure. Remember that even those of us who have been flying for years crash occasionally. You will crash occasionally when you are starting out. Remember what you did wrong and correct the mistake on your next flight. Not to scare anyone away, these are just facts. It is possible to fly successfully right from the start. All that is required is to remember two controls, Up and Down. In between these is Neutral - where the plane should be flown. It's that simple. Just give a little up to take off and, once airborne, come back to neutral and fly the whole flight. Now let's get started. First requirement is the Cox 049 engine. I bought a Cox Baby Bee for my model. I also used an old engine from a long-gone plastic model. If you already have an engine you're all set. If not, I would recommend purchasing a Cox Baby Bee or Quiet Zone engine. These are available almost everywhere from hardware stores to department stores and at all hobby shops. While you're at the local hobby supplier buy the rest of the materials on the list and you are ready to start building. A brief note on the balsa wood: try to get a piece that is not badly warped. Hold the board on its side and sight down the long edge. In this way you can see all the bends. Pick a board that is fairly flat or that has a gradual curve, not one that looks like a roller coaster. Besides the building supplies on the list there are a few other items you will need. If this is your first building project, you will need a knife (X-acto No. 8 will be adequate), glue (Testers B, Ambroid, etc. ), a pack of model "T" pins, and a straight-edge (this can be the metal edge of a common dime-store wooden ruler). Other items are pliers, wire cutter, building board and sandpaper. An optional item that is nice to have but not mandatory is a carpenter's combination metal square. It can be purchased for under $1.00 at just about any hardware department. It also can be used as a straight edge. 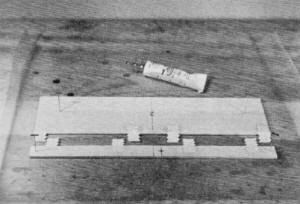 Construction: Layout all the parts on the two 1/8" balsa sheets. A ball-point pen is used to draw these, but do not press too hard. 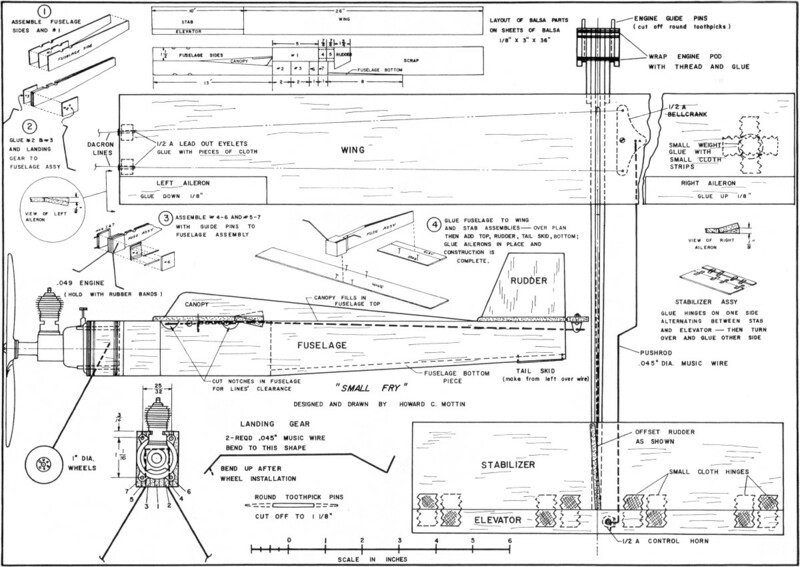 The sketches show how to layout these parts. It will help to number the nose-pod pieces to avoid confusion. The dimensions for the various pieces can be obtained from the side and top views on the plan. When drawing the lines across the sheets, use the square to keep these perpendicular to the sides. When the layout is completed, cut out all the balsa parts using a sharp hobby knife. A large balsa piece will be left over. Save this for repairs or your next plane. We are now ready to begin assembly. I usually build the fuselage first and, while this is drying, work on the tail or wing assemblies. Lay down a small piece of wax paper (approx. 12" square) on your building board. This will prevent the parts that will be glued together from sticking to the board. The first step is to glue the two fuselage sides and the front center (No. 1) piece together. Spread a liberal amount of glue on both sides of the center piece and put a small bead of cement on the tail end of one fuselage side. Then put the three pieces together and pin down to the board on the wax paper. Put four pins through the front section to the board, checking the alignment of all three pieces at each step. Pry up the tail end of the fuselage side next to the board and put a toothpick under it, so it is approximately 1/16" off the board. Pin the tail ends together with two pins. While this is drying you can start assembling the two outside pod pieces. 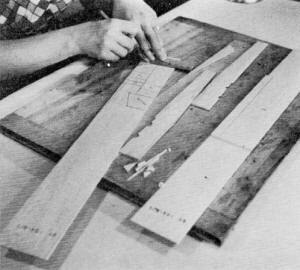 Take four round toothpicks and cut off to the length shown on the plans. Now lay pieces No.4 and 5 on the building board with the dotted lines up. The dotted lines -should be 3/16" from the top and 1 1/16" apart. Using just the point of the knife at an angle of approximately 45 degrees with the piece, cut triangular grooves in these pieces centered on the dotted lines. Do this carefully, taking several small cuts. Measure the groove between these cuts, using the cut-off toothpick as a gauge. Stop when the toothpick just fits in the groove and the top edge is flush. Put the toothpicks in the slots and place the No.6 or 7 piece on top and check the protruding part of the toothpicks for alignment, using the engine mounting holes for a gauge. Miscellaneous: Round toothpicks, thread, small rubber bands (size 16), dope (fuel-proof), thinner, brush (1/2 or 1/4"), Goldberg 1/2A handle with Dacron lines. If everything checks out, glue these two assemblies together. If everything was not right, make a new piece from the scrap-balsa piece. Use a liberal amount of glue in the grooves to glue in the toothpicks and pin these two assemblies down to the board to dry. Check the alignment of the front edges to make sure they are flush and double-check the toothpicks with the engine. Now take out the two pins in the front end of the fuselage assembly and glue the No.2 piece flush with the front. Unpin the entire fuselage assembly after the glue has dried. Place the No. 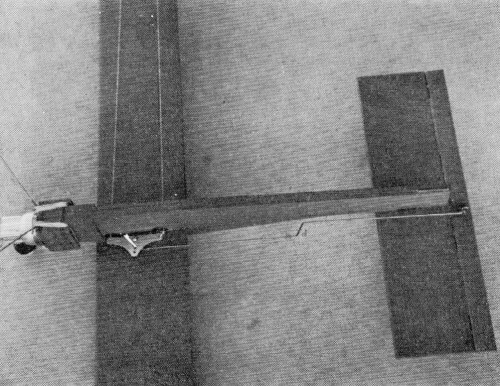 3 piece and the 7-5 assembly and 4-6 assembly on the fuselage and hold the front end with one hand. Use the engine mounting holes as a gauge once again and check the mounting alignment. Chances are that the pins will be too wide apart. But if the engine slides on, go ahead and finish the pod assembly. If the engine didn't fit, slide out the No.3 piece. Lay a piece of sandpaper flat on the building board and lay the No.3 piece on it. Holding it flat against the sandpaper, slowly slide it back and forth sanding it down on one side. Recheck the fit after every three or four sanding strokes until it fits snugly between the fuselage assembly and the 7-5 piece. When everything fits properly remove the engine, and glue the No.3 piece to the fuselage assembly. While this is setting, mark the location for the landing gear mounting hole. This is approximately 5/8" from the front and 5/8" from the top. One of the leftover round toothpicks can be used to start these holes. The two landing gear wires should be made to the shape shown on the plans. Now mount the wires to the fuselage assembly and cut grooves so that the top of the wire is flush with the surface. The engine pod is completed by gluing on the two outside pieces, reinforced by wrapping with thread at the front and back. As the assembly is pinned together, check the alignment, using the engine as a gauge. Spread a small coat of glue over the thread and over the entire front surface of the pod. The triangular hole in the bottom of the fuselage can be filled in with a piece of scrap. Next comes the assembly of the stabilizer or "stab." If you have not already done so, cut apart the elevator and stab. With a piece of sandpaper, round off the leading edge of the stab and the two edges that will form the hinge line. It is easier to work with the stab if it is pinned down to the building board. The stab and elevator should be lined up properly and an approximate one-inch gap left between them. Now take four of the small cloth hinges and cut them in half. With a ball-point pen, make a small "x" at each position where the hinge will be glued on as shown on the plans. Then taking them one at a time, put a small glob of glue on the "x" and press on the hinge cloth leaving about 2/3 to hang over the edge. After these have dried, unpin and turn over the stab and elevator and again mark an "x" where the hinge will be glued on. This will be opposite to where the hinge material is sticking out of the pieces. Slide the two pieces together so that all the hinges are sticking straight up and pin to the board. Then repeat the gluing procedure making sure hinges are tight. Now lay the plan on the building board and lay a piece of wax paper over the top view. The stab is pinned down to the location on the plan, and likewise the wing. Glue on the fuselage following the location on the plan. While this is drying you can glue on the leadout eyelets and the wing tip weight. But remember the plane is upside down, so glue them on the opposite ends of the wing from what you are looking down at on the plan. The weight can be just about anything from a flattened-out fishing sinker to a washer (about the size of a penny). Small pieces of left-over hinge cloth should be glued over these to strengthen them. We're now in the final stages of construction. The canopy piece (top) and the rudder are now glued on. 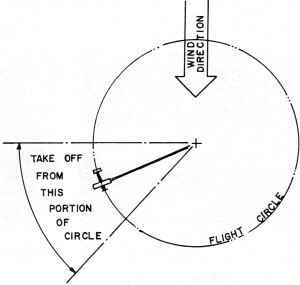 Be sure and offset the rudder so the plane will have a tendency to turn (yaw) to the outside of the circle. Cut out the ailerons and glue in place as shown. The left aileron will be down and the right will be up. The holes for the bellcrank and control horn are added. They can be made using a round toothpick as a drill. The control horn can be fastened on and a small amount of glue should be put over the nut to keep it from working loose. Do not turn the nut so that the balsa is squeezed together, but merely bring it up snug to the surface. The glue will keep it tight. The bellcrank will be installed after the plane is painted. The wheels now are added and the protruding wire bent up so they will not slide off. Make a small wire tail skid from left-over wire and glue in place at the bottom of the tail end of fuselage . This will prevent the balsa from being scraped away. The one remaining task is to paint the little gem. Since this plane will never be a candidate for a best-finish award, there is no sense in spending a lot of time here. Besides, at this point you probably can't wait to get it into the air. So give it two coats of clear dope followed by two coats of your choice of color and call it a day. Be sure and coat the engine pod area thoroughly to keep the fuel out of the wood. Now make a pushrod from the left-over landing gear wire to the shape shown on the plan. Don't forget the "Z" bend in the middle as this is used to adjust the length should one of the ends be a little off. When the paint has dried, attach the pushrod and bellcrank. Line up the bellcrank so it is parallel to the fuselage and look at the tail and see if it is in the neutral position (elevator straight with the stab). If it is not, adjust the length accordingly by bending at the "Z" until it lines up. Take off the bellcrank and thread the Dacron flying lines through the leadout eyelets and the holes in the fuselage. The lines should be tied to the bellcrank using three or four good knots. Tug on the lines to make sure they are securely tied. Bolt the bellcrank back on the fuselage and bring the nut snugly against the wood and add a dab of glue to hold it securely. The construction now is complete. Flying: If this is your first attempt, the best advice is to find someone who knows how to help you. But since this is not always possible, and since human nature is to "go it alone," I will give the next best advice. First, if you have purchased a new engine, you must learn how to start it and how to keep it running. Follow the instructions on the engine package. 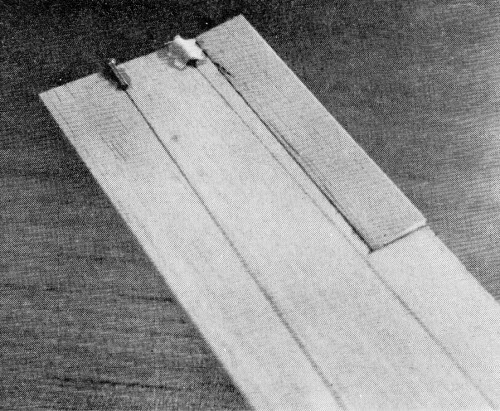 You can use the plane itself, or a small test stand consisting of a board with the engine attached with wood screws for the break-in period. You should run at least four tank-fulls of gas through the engine before attempting any flying. By this time you should have learned how to set the needle valve so that the engine will run steadily for the complete tank of fuel. If not, keep on trying until you do learn. We will have enough problems with flying and can not afford an erratic engine run. After you have learned how to start the engine, and have broken it in attach it to the plane with two rubber bands per side. Check the installation and make sure the engine fits securely and there is no looseness. There is a little scheme we can use to make sure our first flights are a success. This is to spring-load the elevator so that, in effect, the plane will fly itself. This is very easy to do and I recommend it if this is your first flight. All you need are two rubber bands and three pins. The thin small rubber bands, about 1 1/2" to 2" long, are best. Put one pin in the edge of the elevator opposite the rudder. Loop one end of a rubber band around the pin in the elevator and the other end around a pin attached to the rudder. With no tension on the flying lines this rubber band should hold the elevator in a slight up position (1/16"). Now unhook the top rubber band and turn the plane upside down. Loop the second rubber band around the pin in the elevator and around a pin fastened to the fuselage. This should be positioned to just hold the elevator in neutral. Now attach the top rubber band and recheck the position of the elevator. It should be in a slight up position with both rubber bands attached. If not, add a little more tension to the top rubber band. With this little scheme the plane will actually fly itself and you will still be able to control it by over-riding these spring-loads. If the plane should go slack on the lines, which happens most of the time in windy weather, the plane will continue to fly and you will have no problems. For your first flights you should pick a day when there is little or no wind. Pick your flying site carefully. The most important thing is to make sure that there are no overhead power wires in the vicinity. A good site is one where there is a smooth takeoff area approximately three quarters of the flying circle over a grass area. This will help prevent damage to the aircraft. If we have these conditions present then we're ready to start flying. Put your plane down on the downwind side of the circle so that it will be crosswind at takeoff. Then unwind the lines to the center and make sure they are not tangled. This can cause sticky controls. Next, a pre-flight check of the controls is in order. Have your helper hold the plane at flying height and, keeping the lines tight, hold the handle in neutral position. You should be facing the model with your arm pointed directly at the model. Your helper should check and see if the elevator is in neutral (straight with the stab). If it is not, adjust the length of the lines until it is. Then check both up and down control and come back to neutral and check again. You are now ready for the big moment. Fill the fuel tank half full by holding the plane on its side and then start her up. Hold the handle again in neutral position or with a little down control and signal your helper to release the plane. Let the plane roll along the ground and fight the tendency to give up control. The plane will rise on its own if it is neutral and fly at shoulder height. Try to keep it in level flight about 10 feet off the ground and soon the engine will quit. As the model glides downward, give up control, and it will settle to a three-point landing and it's all over. If this is the way your flight went you are ready for your second flight as soon as your heart stops pounding. But, if you had problems with the first flight, here are some additional words. First, recheck the controls. If the plane flew high when you thought you were holding neutral, readjust the lines to give a little more down or readjust the top spring tension to give less up. If the plane did not take off, but rolled along the ground until it hit the grass and quit, you can give a little more up, or try another flight, without changing anything and give a little up control after it has rolled about 10 feet. But come back to neutral as soon as it is airborne. Too much up on takeoff can be disastrous and sometimes results in a wingover straight into the ground. If you got the plane into the air, but had trouble keeping it level, this is caused by over-reaction or over-control. This is a common fault with beginners. This will clear up with more experience, but keep in mind that only a little arm movement is needed for control. Also, with this spring-loaded elevator, all you should have to do is just hang on and let the plane fly itself. What usually happens is that you are applying control without realizing it. Remember to point your arm straight at the plane as if it were an extension of the control lines, and you should have no problems. If you should happen to crash, check over the plane before attempting another flight. Make sure everything is proper. Now that you have earned your wings, welcome to the U-Control flying sport!